At AwesomeCloud, we know how important security is to you and your clients. Small to medium-sized business require the same level of security that larger business already enjoy. As a part of our partnership program, you can offer the security of enterprise-grade network solutions without the high cost or hassle of building your own solutions from scratch. As an AwesomeCloud partner, you’ll be offering network solutions built on the latest technology from Cisco, Juniper, and Fortinet. VLANs provide added network security, the ability to restrict data access, and the ability to create guest networks. You can easily set up one or more VLANs depending on their needs and the risks that are inherent to their company. With a Site-to-Site VPN, your cloud-based solutions will act as an extension of their on-premise resources. Remote User VPNs are also available and enable offsite employees to securely access resources, regardless of their physical location. Whether your client needs cloud-based firewalling to complement their current firewall or wants to provide an added layer of security, AwesomeCloud offers enterprise-grade virtual firewalls that offer unique benefits including scalability, 100% uptime SLA, and anywhere accessibility. Unified Threat Management (UTM) is an all-in-one network security solution that includes a variety of services, like IPS, Anti-Spam, Anti-Virus, WAN Acceleration and more. With uninterrupted security, our UTM solution from Fortinet allows each of your clients to focus on their core business. 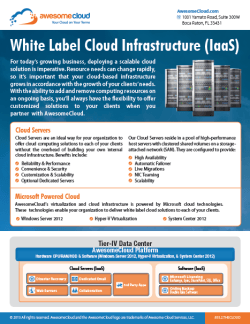 Partner with AwesomeCloud and resell enterprise-grade network solutions to grow your Managed Services business. Contact us by phone at 855.2.THECLOUD, by email at sales@awesomecloud.com, or by filling out a quick contact form.